Home » Cathy's Thoughts » We Are ONE For A Purpose – Just Jump In And Believe! We Are ONE For A Purpose – Just Jump In And Believe! I just completed competing in the 1.5 mile swim from Alcatraz Island to the South End Rowing Club in San Francisco. There were about 800 swimmers who were loaded onto two boats in the wee hours of the morning on September 10th. 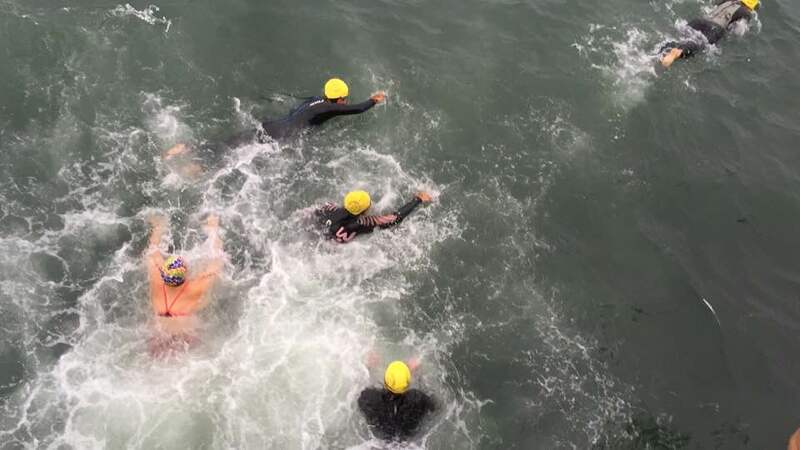 As an ocean swimmer, I had no idea what to expect while swimming in the San Francisco Bay. I was warned about strong currents and tides, and told by a few that I would not be able to handle the cold waters and the waves that would smack me in the face. I thought to myself, this reminds me of what I was “told” many times while working in Corporate America. Instead of being told I could, I was told that I had to work harder to meet company standards, requirements and goals. This swim, which I finished in 45 minutes, was an amazing experience that no one can take away from me. The same should be true in our careers. We can build our own experiences and paths to create an impact. While hanging out on the boat I could not help but think of how cool it was to be hanging out with strangers who had the same goal – get to the shore and get away from Alcatraz as fast as we can. I also thought of it as getting out of prison. Once I jumped into the water I would swim to freedom. If you were to think of the race as an organization, you would see a flat organization. Everyone had their own work styles, hence their own way of training, and goals. The key point here is that we all had a purpose. We were ONE. As I swam through the unfamiliar waters fighting my way past swimmers, I thought that yes, this is a race. But the journey was what this competition was all about. I thought about how cool it was that we were together and in a way, a family. While visiting clients and working in house, I do not see this often. Yes, we have the Googles and the Yahoos of the world who claim that they inspire their employees to be lynchpins, to march to their own drum, and to feel free to speak out and push through barriers in order to reach their goals and the company’s goals. But, while working with such companies I did not see that group of swimmers with the same purpose. I saw and continue to see a lot of individuals looking for mentors to help them train and get to that starting line so they can finish their races. Coming into shore was amazing. I swam faster and faster as I heard the crowd cheering us on. I smiled from the inside out. This is what we need so much more of in our careers. We need teammates and mentors, and yes, we need those lynchpins who will guide us over our cube walls and travel to unknown territories, just as I did in this race. Sure, I was scared. I had no idea what was in front of me. But I did have a support system while training and felt that I had a purpose. We do not have to swim from Alcatraz to San Francisco to prove to ourselves that we can reach goals that we are setting for ourselves. But it sure helps to know where we are heading, where our company wants to go with its purpose, and how we can evolve by growing personally and professionally. The days of the vertical organization are gone. So now, more than ever, it is the time to value what we bring to the table, show our co-workers and managers that we have a purpose that will lead to cause and effect for our company and the world. We all can make a social impact as we reach for those finish lines in life. And most importantly, we need to remember we are not alone in our efforts. We all can jump into cold and unknown waters as a unit and make a huge difference. Swim on my friends and no that you are here to make a difference.